Importance: Native to China, Japan, Korea and Taiwan. Accidentally introduced into the USA in the mid-1990s, only to be established as a long term orchard pest 10 years later. Not currently present in Australia, but has been intercepted at the border by quarantine service agencies. If BMSB was to become established in Australia, it would pose a significant threat to agricultural crops, plantation and native forests, and amenity plant species. BMSB feed on a wide range of fruit crops, vegetables, legumes and ornamental species. Preferred ornamental host plants in the U.S. include amaranth, catalapa, Eastern redbud, English holly, Southern magnolia, various Malus spp. (e.g. crab apple), moth orchid and various Prunus spp. (e.g. sweet cherry). Preferred agricultural host plants include capsicum, eggplant, tomato, sweet corn, apple, stone fruit, soybean and sunflower. BMSB is also a major nuisance pest, aggregating in large numbers inside buildings and vehicles during its overwintering phase, producing an unpleasant odour when disturbed. Description: BMSB has between 1 and 5 generations per year depending on climate. Each female is able to lay eggs two weeks after the last moult and can lay up to 400 eggs. Eggs hatch in 4 to 5 days after being laid. Each of the 5 instars (nymphal stages) take about one week between moulting. Nymphs have been described as being tick-like in appearance. Eggs: Are only 1 mm in diameter, light green to white in colour, barrel shaped and found in groups of 20 to 30. Immatures: First stage nymphs are orange or yellow brown and mottled with black and red, they are about 2.4 mm. Second stages nymphs are dark brown to black. The 2nd, 3rd, and 4th instars slowly develop the typical brown colour with the banding pattern on the legs and antennae as they mature. Adults: Approximately 12-17 mm long with a similar width. They are various shades of brown on both the top and undersides, with gray, off-white, black, copper, and bluish markings. Unique to this species is the alternating light bands on the antennae and alternating dark bands on the thin outer edge of the abdomen. The legs are brown with faint white banding. The stink glands are located on the underside of the thorax, between the first and second pair of legs, and on the dorsal surface of the abdomen. 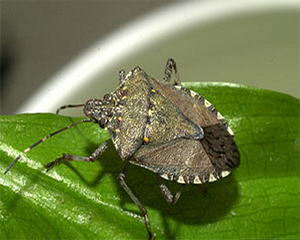 Damage: This insect causes damage to fruit and vegetables resulting in produce that is unfit for sale. Adults generally feed on fruit while nymphs feed on leaves, stems and fruit. They damage fruit by piercing the outer surface of fruit injecting saliva and sucking out juices. This causes dimpling of the fruit’s surface as well as rotting and corking inside the fruit. They also are a major nuisance pest to people as adult insects may enter vehicles, homes and factories in large numbers in autumn months, looking for places to shelter over winter, only to emerge in spring. An initiative of the National Nursery Industry Biosecurity Program (NY15004) and the ‘Building the resilience and on-farm biosecurity capacity of the Australian production nursery industry’ Project (NY15002).